Dense with shredded coconut and rich with chocolate chips. 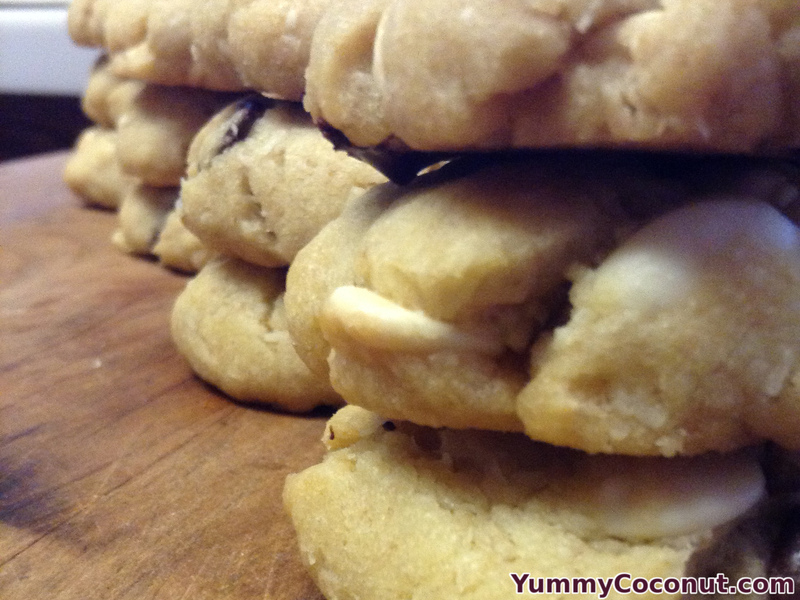 These cookies are a good fix for your chocolate and coconut needs. Cream your butter and your sugars. Add the egg and vanilla, mix until combined. Sift your dry ingredients (flour, baking soda, salt, coconut) in a separate bowl, then add into the wet ingredients. Place cookies on baking sheet, form into balls and press down to flatten slightly. Bake for 10-15 minutes. Once out of the oven, let cookies cool on the baking sheet five minutes before moving. Add different chocolate chips if you like, or mix it up with milk chocolate and regular chocolate. You could even take a bar o chocolate and chop it into chunks if you prefer. These cookies have so much coconut in them that they are a bit stiff. This means that they don’t really spread when they are baking. Make sure you flatten them with your palm before cooking so that they cook evenly. This recipe uses unsweetened shredded coconut, if you want to use sweetened, tone down the white sugar in the cookie recipe to a quarter cup to compensate.